The world’s greatest rock drummer? Consider the obvious evidence. Yet this man is also a solo artist of repute. As the bedrock of the Beatles sound, Ringo's distinctive on the beat style and pioneering tom tom work ensured that the diminutive percussionist won plaudits from peers and more importantly his own esteemed colleagues. Without Ringo - John, Paul and George often said, there was no Beatles and on the occasions he did walk out, they generally wooed him back with hugs and flowers laid in front of his kit. Though making no claim to the finest singer around, nevertheless Ringo’s easy going vocals appeared on most of the Fabs discs. A confident enough country singer, his version of “Act Naturally” became the standard and defined his good-natured approach. His role as a featured singer on stage was never in doubt and the Ringo moment was a highlight of every show the Beatles played from 1962 until they effectively quit live performing in 1966. He also enjoyed commercial acclaim for his talents on “With a Little Help From My Friends” and “Yellow Submarine” while his delightful childlike “Octopus’s Garden” and “Don’t Pass Me By” were self-penned and resilient additions to the canon. Once the Beatles split for good in 1970, Ringo got back in the saddle and made a sequence of fine albums in his own right, which we are proud to detail below. His sales were based on genuine respect for his work rather than as mere nostalgia. Albums like the self-titled Ringo and Goodnight Vienna both featured high on charts and he notched up a straight run of eight Top Ten singles in the USA between 1971 and 1975 during what one might call his heyday. Around this time you will also see Ringo’s name on a slew of recordings for others – the other Beatles, of course, as well as Harry Nilsson and Stephen Stills, amongst many more. Music aside his acting skills were always credited in the Beatles brilliant knockabout movies but he made more of a name for himself as a straight actor later and he has also directed music documentaries, designed furniture and published the excellent Postcards From The Boys, a poignant home thoughts from abroad hardback featuring a fascinating selection of cards sent to him by the other Beatles. He has the MBE and retains a place in the hearts of everyone who grew up with or came to adore The Beatles. And as will be seen his own output is far more varied and eclectic than a cursory glance at his career might indicate. Born Richard Starkey in Dingle, Liverpool 1940, he was brought up in humble surroundings by parents who nurtured his love of music and dancing. The contemporary norm of skiffle and rudimentary rock’n’roll groups would lead him to become a professional drummer and his prowess was noted during his stints with Rory Storm and the Hurricanes and Tony Sheridan, both of whom used him in Hamburg before he joined the main act. He became one of The Beatles at John Lennon’s behest in summer of 1962, replacing the incumbent Pete Best, and the rest is history and best left for the zillion times on all things Fab. Suffice to say Starr can be regarded as the very heart and soul of the globe’s most extraordinary group. But once matters soured, Ringo was quick out of the blocks. His debut solo album is Sentimental Journey where encouraged by his mates and producer George Martin he made the inspired decision to revisit the songs he’d grown up listening to around the wireless in the parental home. These days issuing a set of chestnuts is the norm but Ringo got there first. His takes on “Night and Day” and "Bye Bye Blackbird” are sweetly wrought. The album also contains arrangements from Paul McCartney, Richard Perry, Quincy Jones and Maurice Gibb while the backing from the George Martin Orchestra is bang on the money. But if one views this cosy disc as a testing of the waters the follow-up Beaucoup Of Blues (both these were released in short order in 1970) is quite a stylistic departure. Decamping to Nashville to record with producer Pete Drake, Ringo is even more at home here dealing with some delicious country songs with top notch back up from Charlie McCoy, Jerry Reed and Charlie Daniels – plus other A list Music City alumni. In any case the tracks suit Ringo’s laconic voice and his lugubrious delivery adds a bittersweet nuance to much of the material. In the aftermath of the great break up Ringo admitted he felt like a fish out of water initially but his third disc, Ringo, took him back to Abbey Road and across the sea to Sunset Sound and the Producer’s Workshop where Richard Perry helped him hone a genuinely classy item. This album is noted for the appearance of all four Beatles (though never in one room at the same time) as well as the star cast of players that would become a fixture in his future releases. Lennon’s “I’m The Greatest” kicks off proceedings before Ringo tackles Randy Newman’s “Have You Seen My Baby” and then eases into the lush “Photograph”, a co-write with Harrison. Guests include Nilsson, Jim Keltner, Garth Hudson, James Booker and Marc Bolan and we’d urge you to consider and discover this rather excellent disc. Check out the reissue with bonus material where you get the single “It Don’t Come Easy” (Stills is on piano) and “Early 1970”, a magnificent and often overlooked cut driven by George’s electric guitars and bass. A huge hit album in its day, Ringo holds up remarkably well. Sticking with Perry he then unleashes the fine Goodnight Vienna with Nilsson taking a highly active part. Listen out here for Allen Toussaint’s “Occapella” where Dr. John plays piano and don’t overlook the title track since that’s Lennon counting the band in much as he did in years gone by. Blast from Your Past (1975) is a neat compilation of various good bits that treads water until Ringo's Rotogravure arrives with Arif Mardin in the control room and Eric Clapton making an appearance. Lennon is on hand again as a writer and Paul and Linda McCartney enjoy helping out on Paul’s song “Pure Gold”. Something of a collector’s item today, Beatles fans should discover this for the George track, “I’ll Still Love You”, something he’d originally trialed with Ronnie Spector and Cilla Black. On Ringo the 4th our hero stays with Mardin but starts to write in earnest with collaborator Vini Poncia. The results are a cool delight especially so on Toussaint’s “Sneakin’ Sally Through the Alley” and “Wings” where the rhythm section of Tony Levin and Steve Gadd put a tight shuffle on a song close to Ringo’s heart. He would re-record it with a more reggae twist later. We pick up the story with Vertical Man (1986) and what a comeback this is! The guests include Paul and George as well as All-Starr stalwarts Joe Walsh and Scott Weiland and not to forget Tom Petty, Brian Wilson and Beatles engineer Geoff Emerick. Very much a return to form this disc includes a cheeky remake of “Love Me Do” the one Beatles song where a session man, much to his chagrin, replaced Ringo for the single version. If he reclaims that classic he also coaxes fine performances out of his cohorts. Jeff Baxter offers some neat slide and Steven Tyler pops up on harmonica. A real forgotten gem. The VHI Storytellers live album is a concentrated distillation of much-loved Beatles and solo Ringo pieces – music we never tire of. To bring things into the new millennium we also point you towards The Anthology So Far (2001) where the bulk of the All-Starr material is gathered under one roof. Such is the affection and respect in which Ringo is held the fact that guests here range from Felix Cavaliere and Todd Rundgren to Jack Bruce and Nils Lofgren only adds to the allure. Finding a trusted accomplice in Mark Hudson, Ringo will release Ringo Rama and surprise those who thought he’d given up on the business by turning in one of his finest moments to date via “Never Without You”, a most heartfelt appreciation aimed at his friend George Harrison that quotes some of the man’s loveliest moments, including “What Is Life” and “Something”. It’s a jaw-dropping track. The Live Tour 2003 is another splendid reminder of where Ringo came in since it features versions of “It Don’t Come Easy”, “Honey Don’t”, “Yellow Submarine”, “With a Little Help from My Friends” and “I Wanna Be Your Man”, the song John and Paul gifted to the Stones that Starr sang so well on With The Beatles in 1963. The tale doesn’t end there. 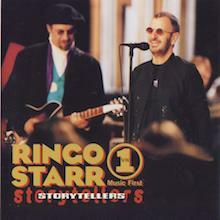 Photograph: The Very Best of Ringo Starr (2007) is a CD plus DVD on the special collector’s edition. And proving that he is very much still a player we also enjoy Liverpool 8 where the main man collaborates with Dave Stewart and Hudson on a most solid rock and roll set that garnered very favourable reviews. Paul and Ringo reunite – the fact they are the only extant Beatles (Best aside) adding extra depth to “Peace Dream” (Macca’s on bass) and “Walk with You” – a number credited to Starkey and Beach Boys lyricist Van Dyke Parks. Heavy stuff. Joss Stone lends her distinctive voice to “Who’s Your Daddy” and Walsh, Don Was, Edgar Winter and Ben Harper add lustre to the whole. And so to the most current Ringo 2012 with the aforementioned “Wings” given a reggae lilt and the assistance of luminaries like Benmont Tench and Charlie Haden ensuring matters are bright and modern while adding a dash of skiffle to keep old Beatles fans happy and smiling. In fact that is Ringo’s ultimate legacy. A man of good cheer with a sad clown’s mask he has borne the weight of fame and the legacy of tragedy within his old band better than anyone could have expected. The world’s greatest drummer? Why not. Now, where‘s his knighthood? Goodnight Vienna was very much a follow-up to Ringo, on which Ringo Starr called upon his bevy of musical buddies. Most prominent among them was John Lennon, who again wrote the leadoff track, "(It's All Da-Da-Down To) Goodnight Vienna," and played on three songs; also included are Elton John, who wrote and played on "Snookeroo," Dr. John, Billy Preston, Robbie Robertson, and Harry Nilsson. Richard Perry again produced, bringing his strong pop sensibility to the diverse material. The only real fall-off was in the songwriting; the album's Top Ten hits were "Only You," the old Platters song, and Hoyt Axton's novelty number "No No Song," which winked at intoxicants, but little else on the set stood out. 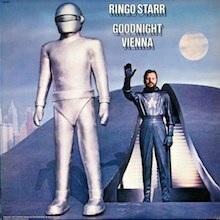 Goodnight Vienna was another enjoyable Ringo record, but it lacked the star power and consistency of its predecessor. Still, compared to the rest of his '70s albums, it was a masterpiece. Yes the Beatles were about to break up,and Ringo know it. And no: Ringo Starr did not have the strongest singing voice of the Fab Four (in many ways neither did George Harrison). But Ringo knew his strengths,weaknesses and vocal range (or lack thereof if one chooses to view the glass as half empty). But one thing you could say about Ringo for sure is that that he liked to have fun making music. And there's a difference between having fun as a singer or musician and making music just for fun. So on this album Ringo bought Paul McCartney,Klaus Voorman and George Martin in as part of the Beatle crew along with the likes of classic arrangers such as Oliver Nelson,Quincy Jones and Bee Gee Maurice Gibb and someone who'd become hugely important to Ringo's musical future-Richard Perry,for an album that...well as Ringo seems to have put it at the time? "I made it for me mum". An album of WWII era standards,the album starts off with the tile track-which is a very British music hall type musical atmosphere. That theme extends into the jaunty ukulele led,almost Peter Noone-like version of "Bye Bye Blackbird". "Whispering Grass","Stardust","Blue Turning Grey Over You","Dream","You Always Hurt The One You Love","Let The Rest Of The World Go By" are all big band ballad styled numbers. The big band's pace is quickened on the swinging "Night And Day"-with Ringo joined by a wailing,be-bop type jazz saxophone solo on the bridge. Voorman's take on "I'm Fool To Care" is a bluesy soul arrangement not too far removed from the musical style a Ray Charles might've used with the song. Considering Billy Preston guests on organ adds to that flavor. Quincy's take on "Love Is A Many Splendoured Thing" is a pop/bossa style arrangement fairly typical of his mid/late 60's soundtrack sound. "Have I Told You Lately That I Love You" is done up in a movie musical version of a then modern uptempo soul sound. Over the years I've heard this album dismissed as being incredibly corny, even stupid. However you won't hear that from me. Within the past two decades? Its become extremely fashionable,when an artist is running dry on original material,to make an album or two of standards. In the late 90's/early aughts Rod Stewart seemed to be making a career of this approach. So maybe Ringo was a bit forward thinking here on that level,even if he wasn't perhaps overtly aware of it. Another thing about this album is that not only are these arrangements not cliched,something so easy to do with standards,but they don't leave the rock era in the dust. 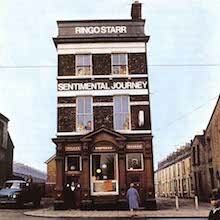 In fact Ringo explores bluesy soul and even jazz on this album as well. It also makes sense that he made this because the Tin Pan Alley pop music this albums celebrates was very inspirational as interpretations on the earlier Beatles album. So while not a proper pop/rock album of its time? Its a conceptually influential one as well as creatively rebooting Ringo's career very successfully. With songs such as "Act Naturally","What Goes On" and "Don't Pass Me By" being hugely popular Ringo entries into the Beatle catalog? And with Ringo's affinity for Westerns and cowboys in general during his youth? The idea that he would be drawn towards making a country/western album so early in his solo career came as absolutely no surprise. After all,it was not a bad option to fully musically separate himself from being Ringo the Beatle. So Ringo decamped to Nashville,likely to jettison some of the post breakup drama of the Beatles as well and recorded this album with a group of the city's best musicians. And this included the likes of Charlie Daniels and four of Elvis's former back up singers the Jordanaires. So how did Ringo approach his country album anyway? The title song,"Love Don't Last Long","Without Her","Woman Of The Night"...in fact most of the songs on this album are sweet country swing ballads with a lot of steel guitar twang and some excellent doubled up acoustic guitar strumming. "Fastest Growing Heartache In The West" is a spirited uptempo number and one of my favorites here along with the rhythmic "$15 Draw"-another favorite of mine. "Silent Homecoming" is a contemplative ballad dealing with the subject matter of a soldier returning dead to his fiancee-likely from Vietnam. Ringo's own composition "Coochy Coochy" is a very melodic,uptempo Nashville style C&W number while my favorite on here-the unreleased "Nashville Jam" is a funky,grooving instrumental with a heavy New Orleans/Meters type flavor about it-full of blues and soul all the way. My father and I both consider this album to be among our very favorite of Ringo's. And country music isn't even a genre that particularly interests me. Of course another country album we both have mutual admiration for is Dylan's Nashville Skyline,so no surprises there. There are two things about this album I do appreciate. The musicians involved in making it pitched it to write songs specifically for Ringo,not merely presenting him with country standards others had already recorded. They also tailored it to Ringo's vocal range,so he really was feeling these songs vocally too. While it may seem a bit odd for Beatle admirers to hear Ringo singing songs about suicidal romances and being romantically interested in prostitutes (yes,you'll hear that on these songs as well)? 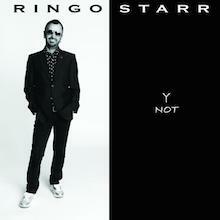 It really is one of Ringo's strongest and in a way most defining solo release. This is Ringo's greatest album. Even better than the five star RINGO. The timing was perfect for Ringo to hit one out of the park and that he did! "Drift Away" is stunning. Ringo's singing is warm and wonderfully nuanced. The acoustical production on this is fabulous. The added vocals by Tom Petty and Alanis Morrisette make this an instant classic. They make up three generations of Rock & Roll classic artists. The combination is so captivating. This song should be a single. "I'm Yours" is a beautiful, touching, and warm ballad that features the greatest quality of Ringo's voice. That wonderful melodic warmth. This is my second favorite track on the album. 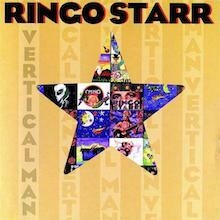 "Vertical Man" Another stunning vocal performance by Ringo. I was expecting the typical catchy Ringo type numbers but what totally blew me away when I listened to this cd was the depth and texture of the songs. "La De Da" What else can you say, this is totally Ringo!! "King Of Broken Hearts" Next to "Drift Away" this is the greatest vocal performance of Ringo's career. Again, the wonderful nuances! 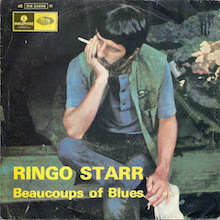 All of the underrated brilliance of Ringo's singing on "Beaucoups of Blues" is equaled and even surpassed here. Ringo is an awesome country singer. "Puppet" Phenomenal drumming on this track and on the album as well. Ringo is rock steady as usual and his fills are as wonderfully emotional and melodic as usual. But he even stretches his style some more to show us a "busier than usual" drumming style. Ringo simply proves that he can fire off eighth note or sixteenth note tom fills at will. And of course there is that wonderfully loose and open snare sound of his. And the slightly behind the beat fills that he originated are all over the album "One" Caught my attention instantly. As powerful an opener as "I Am The Greatest". "Love Me Do" This version rocks. A powerful statement by Ringo that puts the exclamation on that point for good!!!! I had high expectations for this cd and I was delighted when I listened to it. Easily one of the best Beatle solo albums. Interestingly this sounds more Beatlesque than any other Beatle solo effort. I thought that Ringo's last album 'Time Takes Time" was an underrated gem. And as well produced as that was, this one is off the charts! Ringo is The Greatest! It is a shame that Ringo didn't do this years ago while he was still recording for Apple Records because he would have literally cleaned up. Ringo still remains the most accessible Beatle; and, truly, the most fun loving. A quick listen to this live recording clearly tells the listener that Ringo is enjoying himself on stage with his Roundheads. This recording is a real treat for Beatles and Ringo fans alike. Ringo treats us to his Beatle classics like "With a Little Help From My Friends," "Octopus's Garden," and "Don't Pass Me By." He also entertains us by presenting marvelous renditions of his Apple years. These include songs like "It Don't Come Easy," "Photograph," and "Back Off Boogaloo." Ringo's band -- consisting of Rock legends the likes of Joe Walsh and Mark Hudson -- play to absolute perfection. 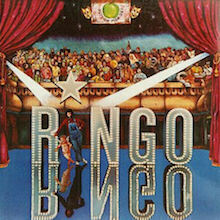 The music is very tight; it certainly supports Ringo's limited -- but highly effective -- vocals. As a matter of fact, Ringo's voice never sounded better. This is probably because he is actually enjoying himself on stage with his "Roundheads." The songs are a treat in themselves. But, Ringo goes one better, he entertains the crowd with short stories in between each tune. For example, he tells the audience how the original words to "With a little help. . . . " were as follows: "What would you do if I sang out of tune/Would you stand up and throw a tomatoe at me." Then, Ringo states in his hard, Liverpoolian accent: "Well, I'm certainly not going to sing that." Whether these tales are true or not, they are very endearing and serve well to draw the listener even closer to Sir Richard Starkey, MBE. This is a great CD from one of the nicest, kindest individuals that ever walked this earth. Going back to that tragic night of 8 December 1980, Ringo was the first Beatle to arrive in New York to "pay his respects." Indeed, Thank God for Ringo. This is a great CD that features terrific music, great vocals, and lots of fun. This CD is well worth owning. Buy it now! You won't be disappointed! Like a good wine, Ringo just seems to keep getting better with age. His last few efforts going back to 1998's Vertical Man saw a creative rebirth of his talent. He then followed that up with Ringo Rama (and his beautiful tribute to George Harrison, "Never Without You"). His personality, charm and sly humor really came through on that CD, not to mention some flat out rocking tunes. Not to be outdone, in 2005 he released 'Choose Love' which was more or less in the same vein as Ringo Rama, choosing and writing some excellent material that could have been RR-part 2. Now comes Liverpool 8, where he expands on the formula that was present on his two previous efforts. Nostalgic, irreverent, fun and the continual propulsion of the back beat that we've know for 45 years, pardon the pun, hasn't missed a beat. Both he and George were overshadowed in that other band they played in, and if either he or George were in another band, they easily would have been leaders. 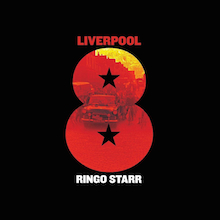 Liverpool 8 doesn't travel far from the 60's inspired peace and love themes, but like McCartney asked in 'Silly Love Songs', "What's wrong with that"? It's a testament to the man's (often underrated) talent that he can produce fresh, vibrant and creative music, and the age of 67! Do yourself a favor and get this CD, sit back, enjoy and just have fun. There are no deep life-altering lyrics (OK, Ringo I really love ya, but deep lyrics haven't always been your strong suit--sorry) but just listen to one of the great masters doing what he does best, and it sounds like he's having a great time doing it. Keep them coming Ringo, we love ya! The Beatles never quite made a commercially released Christmas album, though they put together special singles for their fan club every year from 1963 to 1969, then compiled them as The Beatles Christmas Album, also just for the fan club, in 1970. These recordings were more spoken-word than musical, though there was a song, "Christmas Time (Is Here Again)," heard in excerpts on the 1967 record. It has been left to Ringo Starr to release the first full-length Christmas album from a Beatle, and I Wanna Be a Santa Claus is very much in the group's spirit. Since he returned to recording in 1992, Starr has made a point of making music reminiscent of The Beatles, hooking up in 1998 with a group led by Mark Hudson dubbed the Roundheads. Hudson is everywhere on I Wanna Be a Santa Claus, co-writing the half-dozen originals with Starr and others, co-producing with Starr, and handling a variety of instruments. He and keyboard player/arranger Jim Cox clearly are steeped in The Beatles, and they have effectively recreated a Beatles sound on the record, in some cases aping specific songs. the Roundheads are also good at showcasing Starr's drumming, which is always high in the mix. If none of the new songs are likely to become classics, they are respectable efforts that Starr handles well. On the standards, Starr is his usual good-natured self, and the standout track is the cover of "Christmas Time Is Here Again." There are precious few lyrics besides the title, but it deserves to be added to the ranks of Christmas standards. 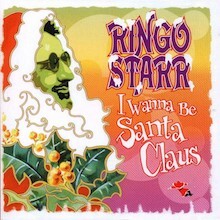 So, Ringo Starr is well-served by his supporting musicians on I Wanna Be Santa Claus, and his typically cheery manner is so well-suited to the holiday spirit that it's only a shame he waited so long to make his seasonal recording. Ringo Starr defined his solo career through his collaborations, scoring his first big hit with the assistance of his fellow Fabs and later sustaining himself through his All-Starr Band, so his decision to produce 2010’s Y Not on his own appears to be a big deal. Of course, those collaborators sharpened Ringo’s focus but never altered his amiable pop -- that friendly, shambling sound is Ringo, something Y Not proves without a shadow of a doubt by sounding virtually interchangeable with its immediate predecessors despite a production that inexplicably feels like a response to George Harrison’s 1987 comeback, Cloud Nine. Since Ringo bathes himself in unrepentant nostalgia, this 20-year flashback is odd but appropriate because Starr is all about cheerful reminders of happy times filled with Peace Dreams and memories of “The Other Side of Liverpool.” Starr does have some famous friends to bolster his journey through the past -- Van Dyke Parks co-wrote “Walk with You” but his presence is obscured by a Paul McCartney harmony, Joe Walsh is partially responsible for the stiffly thumping “Fill in the Blanks,” Richard Marx keeps the '80s nostalgia flowing on “Mystery of the Night,” while Joss Stone valiantly tries to pull the proceedings into the present on the album-closing “Who’s Your Daddy,” a song where Ringo comfortably plays second banana -- but he has no overall collaborator; he’s steering this ship himself and has no desire to depart from his familiar course home. Again, like there was on Liverpool 8, there is charm to Starr’s tried and true: exciting it is not but it’s as comforting as an old friend who doesn’t change, he just stays the same. 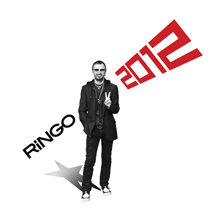 Delivered during the dawning days of 2012, Ringo 2012 is a state of the union address from the beloved Beatle, a brief telegram of all the sounds and sentiments important to Richard Starkey as he begins his 72nd year. Ringo walks the line between the past and present, celebrating the former through the spectrum of the latter, producing a crisp, irrepressibly cheerful dose of nostalgia, one where he covers childhood favorites (Lonnie Donegan's skiffle classic "Rock Island Line" and Buddy Holly's "Think It Over," a version that popped up on the 2011 Holly tribute Listen to Me; "Slow Down" is not the Larry Williams tune the Beatles covered, it's an original with the same name) and revives two old album tracks from the '70s, "Step Lightly" and "Wings," choosing the latter for the record's first single. Take these four cuts away, and there are only five originals left on this 28:50 album, songs about Liverpool, the Fabs, Sambas, good vibes, and peace & love. Ringo being Ringo, he gets by with his high-profile friends -- Glen Ballard, Van Dyke Parks, Dave Stewart, and brother-in-law Joe Walsh all chip in on the collaborations -- so the record doesn't have a note out of place -- good cheer to bring a smile to longtime Beatles lovers.